It’s Open House month, CANSI dates for prospective ski instructors have just been announced — and we’re still looking for a few good volunteers! Great Turn-Out for MEC Snowfest! 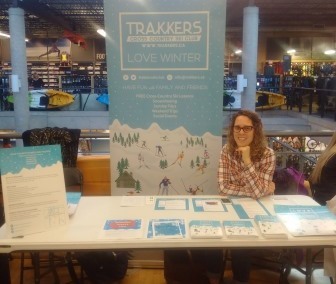 The Trakkers table at MEC Snowfest on November 5 was a big success! We had lots of shoppers swing by to learn more about the club and we hope to see some new faces out with us at the start of the season. Thanks to all the Trakkers members — Sam, Han, Michelle, Heather, Marianne, and Judy — who came out to help staff the table! Trakkers is looking to recruit and certify at least 2 new ski instructors this season in order to keep pace with demand for lessons. All Trakkers instructors are trained and certified by the Canadian Alliance of Nordic Ski Instructors (CANSI). If you’re interested in taking your skiing technique to the next level and giving something back to the club, this can be a great way to do both — plus, there’s perks! You don’t need to know how to do both skate and classic ski techniques as CANSI offers certification for classic instruction only as well. For anyone who completes the Level I training and commits to teach with Trakkers for a period of time, the club reimburses the costs of the CANSI training and certification, and covers trail/bus fees while teaching as an incentive. Our instructors teach for approx. 90 mins on the morning of each of our Sunday trips, and then are free to get their own ski in through the afternoon. Trakkers is holding our annual Bus Captain training boot camp for all returning and potential new captains on Saturday, December 10 — and we’re still hoping for 3-4 more members to join us, in order to round out our roster of volunteers this season. Being a bus captain is a great way to meet more people in the club and to give something back at the same time. Our bus captains are responsible for registering all skiers as they board the bus, purchasing and distributing the club’s trail passes when we arrive at the resort, and acting as all-around ambassadors on each Sunday trip. It’s a ton of fun, the club provides full training, and as an extra incentive, if you volunteer as a captain the cost of your Sunday bus fare is covered by the club. We require two bus captains per bus for each of our Sunday trips. See You at the Open House on Friday! Finally, a reminder that our annual Open House will be this coming Friday, November 18. At the Open House you can meet all our ski instructors, members of the board, and other ski club members, as well as learn about the resorts we visit on each Sunday Trip. We’ve also got some fab door prizes lined up! Reminder to all members that registration for our Weekend Trips will start at the Open House on a first-come, first-served basis, so bring payment to reserve your spot! See the Weekend Trips page on our web site for full details. This entry was posted in President's Blogs on November 13, 2016 by trakkers.